Getting ready for Shabbat each week can often feel overwhelming. We need to prepare all the food ahead, and clean the house enough so that it is pleasant to be in for a day. This can be a tall order if left until Prep day. We have been starting our preparations earlier in the week with very good results. 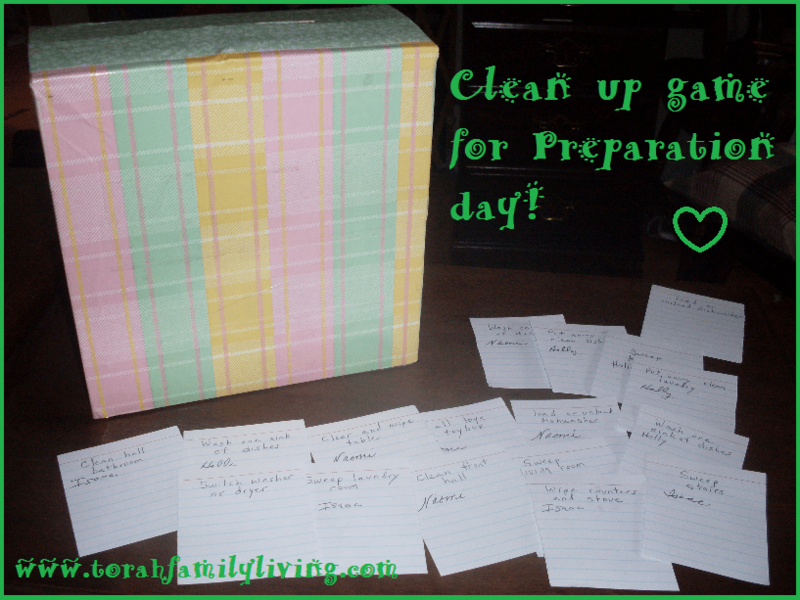 If you have children around, here is a fun little game to encourage them to help you with your preparations. I cut several index cards in half and wrote a simple chore on each. If there are larger tasks, break them down into smaller ones. 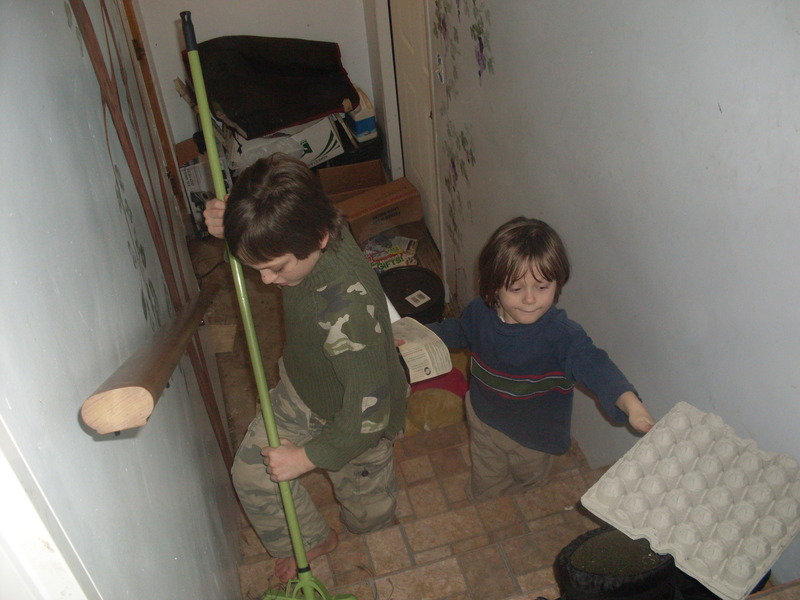 Some of ours include sweep living room, wash one sink full of dishes, clear and wipe table, pick up toys. I have a pretty decorated box with a slit cut in the top. You could also use a basket or box, etc. I lined all the kids up to explain the rules. We have a buddy system in our house, so we have ready made teams. You can let your kids work individually or as teams. Teams give you the benefit of pairing older children with younger children. The goal of the game is to get the most completed cards in the box. To do this, they pick a card (we turned them face down) and complete the job. Then they must have their job checked by an adult. Gramma helped me with this so that we had two checkers. If the adult is satisfied with the job, the adult puts the child’s name on the card and puts it in the box. Then they select a new job. If the job needs some work, the adult can point out what still needs to be done, and when it is complete, they can finish the card. We set a timer for 45 minutes to make sure the game had a definite end. The kids just happened to complete the job in 32 minutes! Way to go! At the end of the game, have a fun little ceremony announcing how many cards each team or child completed. Provide lots of clapping and cheering and enjoy the jumpstart you just got on your prep day! Let me know if you play this game with your kids! 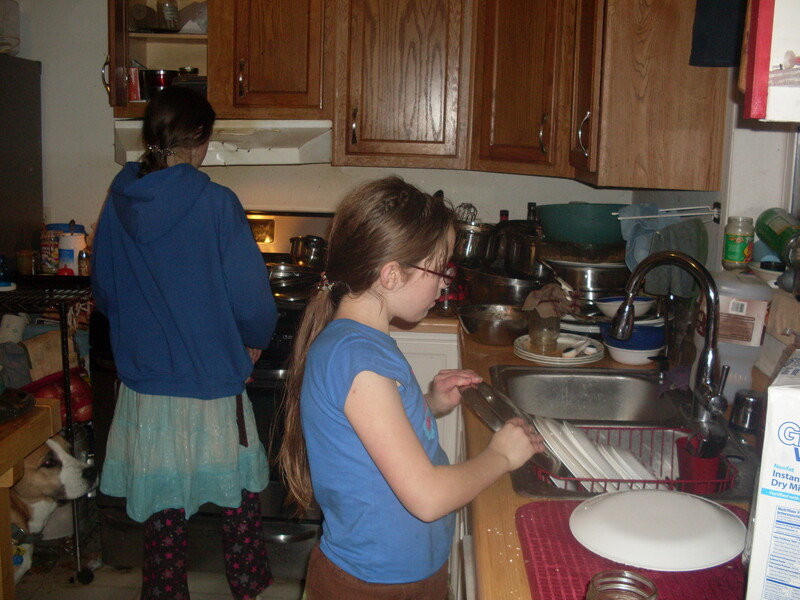 Do you have fun ways to include your children in Shabbat preparations? I did the same thing with my kids when they were young — and found it a wonderful way to work together as a family. Once in a while I had a variation where each one got to take turns telling the others what task they needed to do — and even check the others’ work for quality. They quickly learned to apply grace to one another, lol! We have a similar one where one gets to be the judge. Fun times!